This is how we'll be feeling today in Sydney... HOT!. 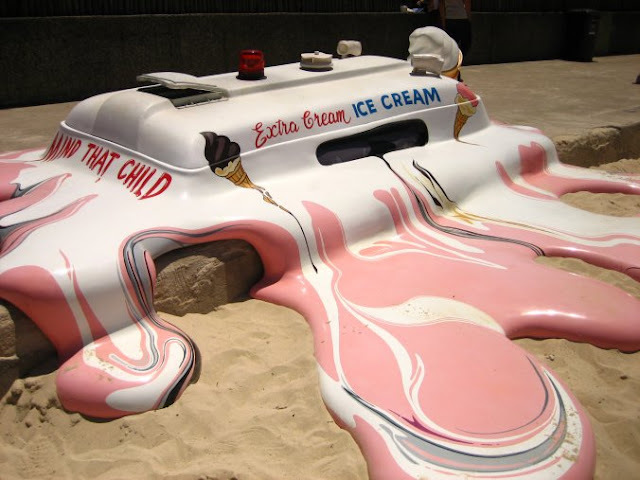 Heck, even ice cream trucks will melt as we reach an expected top of 45 degrees Celsius in Sydney today, and equally high temps in parts of Australia. This brilliant piece is by Australian sculptor Orest Keywan for the 2006 Sculpture By The Sea outdoor exhibition - he won the $30,000 prize for this very clever installation, along the coastal walk from Bondi to Tamarama. How will YOU be spending this scorcher of a day?